How Does Mental Health Affect Alcohol Use? What are the Social and Environmental Factors Behind Alcoholism? According to the 2015 National Survey on Drug Use and Health, 15.1 million American adults struggled with their alcohol use. Approximately 88,000 people die from alcohol-related causes each year. If you or someone you know has an unhealthy relationship with alcohol, you’re probably searching for information about the causes, symptoms, and treatment options for alcohol use disorder. And you may be wondering: is alcoholism hereditary? Get treatment now if you are struggling with your alcohol use, and read on to learn more about the underlying causes of alcoholism. First, though, let’s get a handle on some terminology. Parents pass hereditary material, known as DNA, on to their children. DNA is divided up into segments known as genes, and genes control which traits a person will have. Sometimes DNA undergoes permanent changes, creating what is known as a gene mutation. Some gene mutations can lead to diseases, known as genetic disorders. Research suggests that almost all diseases are at least partially genetic in cause. When parents pass their genetic information on to their children, gene mutations can be passed down as well. If inherited gene mutations cause disorders, these are known as hereditary diseases. Some hereditary diseases are caused by a single gene mutation, while others stem from the combined effects of multiple gene mutations. The environment in which a person lives can also have an impact on the development of hereditary diseases. Alcoholism – or alcohol use disorder – is a condition in which people are unable to control the amount they drink, even when it has negative consequences. For people suffering from alcoholism, alcohol creates an initial sense of pleasure. This can temporarily mask alcohol’s negative effects and make it difficult to stop drinking. Overconsumption of alcohol can make people less able to work, can damage social relationships, and can have serious financial consequences. There are also severe physiological effects of alcoholism, including mood disorders, heart disease, liver disease, and various forms of cancer. Now that we’ve gone through the terminology related to alcoholism, let’s consider whether it’s possible to be genetically predisposed to developing an alcohol use disorder. Alcoholism is a complex disorder. A range of factors – including genetics and life circumstances – can lead to problematic use of alcohol. When looking at the causes of alcoholism, genetics account for about 40 to 60 percent of the difference between people who are at risk and not at risk of alcoholism. People who are at risk have a genetic predisposition to break down alcohol in a way that creates a pleasurable effect. There is no specific gene that leads to alcoholism. Instead, different combinations of genes may have an association with an alcohol use disorder. These genes interact to affect brain pathways related to reward, behavior management, and reactions to stress. There is evidence that the sets of genes responsible for alcoholism can be passed down within families. A family history of alcoholism, however, does not guarantee that someone will face issues with alcohol consumption. Having an alcoholic parent makes people 4 times more likely to develop an alcohol use disorder. Fewer than half of people whose parents suffer from alcohol use disorder develop problem drinking behavior themselves. There are links between genetics and alcoholism, but genes alone do not determine a person’s risk of developing alcohol use disorder. Other factors, including a person’s mental health and emotional wellbeing are also key to understanding alcoholism. People with genetic predispositions to mental illnesses, such as depression and schizophrenia, may be more likely to consume too much alcohol. Especially when people are not receiving treatment for their mental illnesses, they may self-medicate using alcohol. For others, anxiety issues and difficulty managing stress can also be important precursors of problem drinking behavior. Without social support to manage stress, people may turn to drinking as a means of calming down. People struggling to cope with mental health issues and alcoholism may want to explore dual diagnosis treatment. This method of treatment can help with managing the mental health factors behind alcohol use, and can help you to better understand the mental health triggers for addiction. In addition to the genetic and mental health factors underlying alcoholism, a person’s life circumstances can also have an impact on unhealthy drinking behavior. Some people may drink to feel more comfortable in social settings. Others may drink as a way to escape from financial or work-related stress. Some may drink in an attempt to cope with marital issues or relationship breakdown. Alcohol is easy to obtain, and drinking is generally viewed as a socially acceptable behavior. For these reasons, unhealthy alcohol use can easily go undetected by the family and friends of the person who is falling into alcoholism. What may begin as a response to environmental stresses can spiral out of control, particularly for people with genetic predispositions to alcohol use disorder. As people begin consuming alcohol more and more frequently, they become less able to manage their desire to drink. 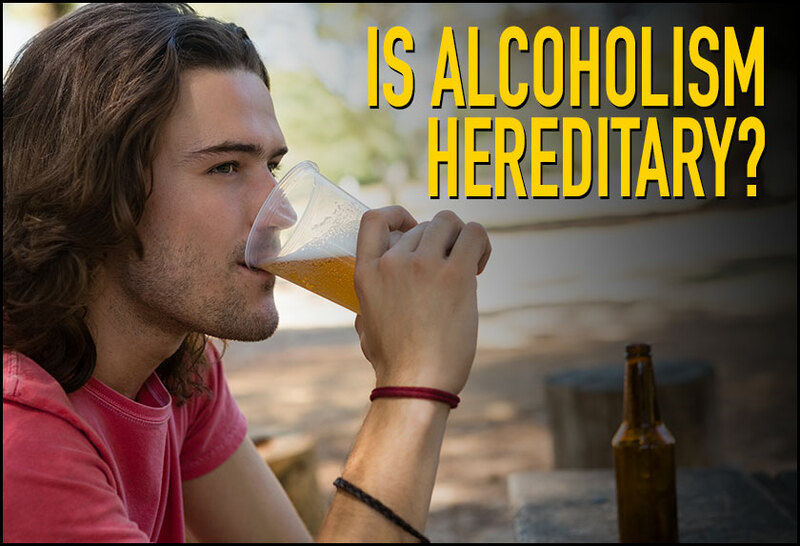 In this post, we explored the question: is alcoholism hereditary? By understanding the root causes of alcoholism, we hope that you or your loved ones will feel better prepared to enter into treatment for alcohol use disorder. Understanding the symptoms of addiction and family history of alcoholism is often the first step in seeking out help. With this background knowledge, you’ll then be prepared to explore personal triggers for alcohol use and any stressors in your environment that may be causing you to drink. If mental health issues are a factor in problem drinking, it may also be helpful to receive counseling or therapy in addition to addiction treatment. The causes of alcoholism are complex, but once you understand its origins, you can take action to get your addiction under control. Contact us today if you or a family member is struggling with alcohol addiction and would like compassionate, holistic, and personalized support. Is Alcoholism Hereditary? Genetics account for about 40 to 60 percent of the difference between people who are at risk and not at risk of alcoholism.